For the Congress cadre, a Rahul-Priyanka Gandhi combo works better than a solo run for the scion. The recruitment of Priyanka Gandhi Vadra into formal politics was never a question of whether but when. Rahul Gandhi, it seems, has decided that the time is now, since he is fighting the battle of his life to oust Narendra Modi from power. And who better to bring to your side than someone more gifted than you in terms of class and chutzpah? At the very least, the party’s grassroots, which has been demanding her induction for a long time now, will be enthused. There are obviously many reasons for her appointment as general secretary in charge of eastern Uttar Pradesh at this juncture. Most important among them is the reality that the main fight in Uttar Pradesh is between the Bua-Bhatija combine of Mayawati and Akhilesh Yadav, who have arrived at a seat-sharing deal, which gives them 38 seats each, with four for the rest, including presumably two to the Congress and two to the Rashtriya Lok Dal of Ajit Singh. This fight between giants – the arithmetically strong SP-BSP combine on one side, and the formidable chemistry of the Modi-Shah-Yogi election machine on the other – leaves the Congress out in the cold. What Rahul Gandhi has essentially done is to accept this as a fait d’accompli, and focus on his priority No 1: defeating Modi even if the Congress does not directly benefit. The induction of Priyanka is intended to challenge the BJP’s dominance in eastern UP since the minority consolidation in western UP is seen to be signed, sealed and delivered by the SP-BSP combine. The east is where the BJP needs to be weakened and Priyanka Gandhi is supposed to do that by weaning upper caste votes away from the saffron combine. Hopefully, the presence of Priyanka will tie down the Modi-Shah combo in eastern UP, making it difficult for them to campaign elsewhere. The second reason has to do with political optics. Since the BJP is targeting the Gandhi family on scams – National Herald, AgustaWestland and Robert Vadra’s land capers – Priyanka’s entry allows her to play the victim card, and the Gandhi family will claim that vendetta politics is at work. With her husband Robert Vadra and his mother now under scrutiny by the Enforcement Directorate in a case of alleged money laundering, Priyanka can claim personal victimisation by the government. Some voters may buy the story. There could, on the other hand, be a family angle to this decision to get Priyanka immersed in party politics. Currently, the party’s power duo comprises Sonia and Rahul Gandhi, with Rahul managing the day-to-day affairs of the party, planning its strategy and leading it in the next electoral fight, and Sonia Gandhi stepping in whenever Rahul’s own clout does not work with the opposition parties. Also read: Is Priyanka Gandhi the greatest victim of patriarchy in Indian politics? Sonia’s behind-the-scenes role in the party will remain strong in the foreseeable future, but it leaves a question mark over what Rahul will do in case he either has to lead a coalition or work on expanding the party’s footprint after the polls and needs a strong hand running the party organisation. Logically, it is the brother-sister duo that will become the party’s key power centre as Sonia recedes into the background after May 2019, especially if all regional parties fall in line on Rahul’s leadership. Induction of Priyanka Gandhi into the party power structure is crucial in this situation, though it is far from certain that the BJP is going to be easily wiped out in 2019. The last reason for Priyanka’s induction has to do with media optics and management of the dynasty narrative. While Rahul Gandhi has found his voice and the rank-and-file in the party feel more confident about him than ever before, there is a huge phalanx of voters that won’t easily buy into Rahul. This is where Priyanka, with her Indira Gandhi looks and stronger political instincts, will play a role. The media, never very good at questioning the dynasty, will follow her like a poodle and make small soundbytes go a long way on news channels. This helps counter-balance the distrust of voters who have never taken strongly to Rahul, and are additionally suspicious of Sonia and her Italian origins. 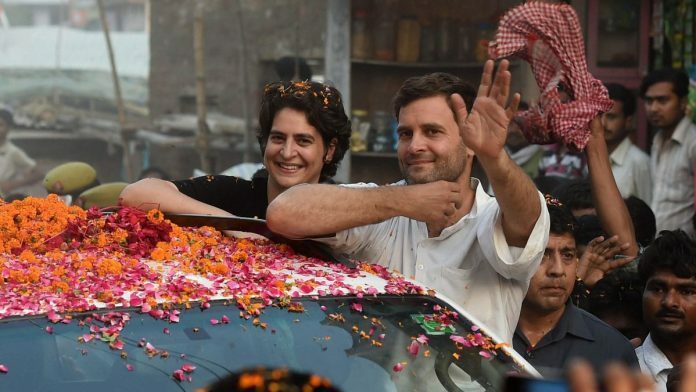 For the party cadre, a Rahul-Priyanka combo works better than a solo run for the scion. Will it all work? Difficult to say yes or no right now, as Priyanka’s role in the campaign is yet to unfold, but it sure cannot do any damage. The author is Editorial Director, Swarajya. He tweets at @TheJaggi. People laughed at Rahul Gandhi. Anyone else would have taken Sanyas. But, he did not. And now, he has managed to win three important Hindi belt states for the Congress party. No mean achievement. Modi was good for India. A strong leader is always good for the country. But, it is as important to have a strong opposition in a democracy. And Rahul Gandhi should provide that. If Priyanka Gandhi can manage to win s few seats for the Congress in UP it is good news. We will have a coalition government that will be stable. Great fireworks and great politics during May 2019. Jai HInd. Bharat Mata Ki Jai Ho. We should aim for a vibrant pulsating democracy of the people, by the people and for the people. There is no place for a few men to rule many men. We need a government that governs well and wisely. In the short foray that Priyanka earlier made into campaigning for Congress , she did not cover herself with glory, descending to street level words and descriptions of Modi. One suspects that she too is afflicted by the feeling of ‘contempt’ that her brother and mother have for Modi and their perception of Modi as an upstart who does not ‘belong’ in ‘their’ Delhi. If she is able to show that she has an open mind about Modi/BJP/RSS et al, and restrains her temper, she may be an advantage to Congress. But one does not feel confident that this will happen, and her introduction into the fray is only likely to make it more bitter. Really interesting how right wing ideologues ignore any effect PG may have on the election. Taking a purely centrist view it makes absolute sense that the Congress will dent the BJP with the upper caste voters as the Sp-BSP will consolidate Muslim votes. This may not mean more seats for the congress but will definitely mean less seats for the BJP. Ultimate sĥilling for Bekaar Gupta and team, are you sold out preśśtitutes gonna call strìppers now and have an oŕĝy to celebrate? Today’s voters are more knowledgeable compared to a decade back.They know that Priyanka is more a pretty doll than a good politician.They have seen brilliant BJP women leaders like Nirmala Sitaraman and Smriti Irani, who are extremely good policians who will contribute so much for the good of the country.Days when voters used to be carried away by good looks have gone.One to one Smriti will defeat Rahul or Priyanka and in Karnataka Nirmala will win hands down. Brilliant and contributors to tothe common good 😂😂😂. Sycophants are the same , whether in the BJP or in the Congress. Thanks for the laughs Mr Nagaraj. For people who are inimical to the Congress and the Gandhis, there is always a temptation to use the sister to undermine the brother, spin her induction into active politics as a vote of no confidence in his abilities. That narrative is past its sell by date. Ever since Gujarat, the old jokes and jibes sound jaded. It is a small family and they have a large party to manage. As Shri Shekhar Gupta has tweeted, pushing her into the deep end of the pool, in eastern UP, shows a willingness to take big risks, face a trial by fire. We want to see more good people in politics, are tired of this petty, personalised conversation. Let voters decide. Does this author ever believe that Rahul was aiming to be PM at all? Rahul is only interested in overseas trips of dubious nature. If Priyanka becomes the PM, then as they say in Hindi ‘paanchon ungliyan ghee mein aur sir kadai mein. (icing on the cake for RG)’. God save Indian democracy from these opportunities who deliver nothing but enjoy entitlement because of their last name.